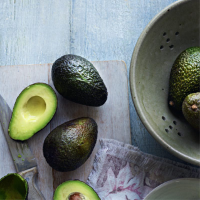 "Creamy avocados have a subtle, slightly nutty flavour and are best paired with zingy flavours that offset their richness, such as lime, ginger and chilli." 1. Cook the brown rice according to pack instructions. Meanwhile, mix the rice vinegar with the ginger, oil and honey, then season. 2. When the rice is cooked, drain, then toss with the dressing, radishes and watercress. Gently toss with the salmon and avocado slices. Season and serve.